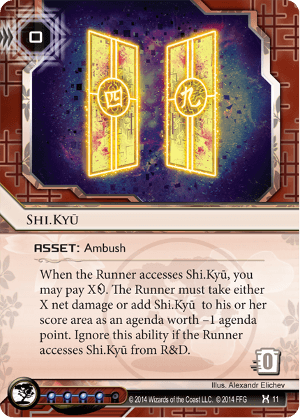 When the Runner accesses Shi.Kyū, you may pay Xcredit. The Runner must take either X net damage or add Shi.Kyū to his or her score area as an agenda worth -1 agenda point. Ignore this ability if the Runner accesses Shi.Kyū from R&D. Japanese for Four.Nine; in Japan these are unlucky numbers as they sound like Death.Suffering, which incidentally is the options this card presents to a runner. can be priced to cause seemingly non-lethal damage when actually it will drop the Runner's grip size enough to let Ronin or several Neural EMP(s) flatline them next turn. Not comparible to Snare! as it can't flatline and doesn't protect R&D. When giving the runner the -1 AP or disrupting with some net damage are both acceptable, consider bidding low, eg 2. It is surprising how little damage you need to threaten, they will often take the -1 AP just to get it out of your servers so they don't have to worry about accessing it again.